There’s been no shortage of studies and health articles in the press about the benefits of eating a Mediterranean diet (find out more about the Mediterranean diet here). Eating this diet has been associated with a healthier heart, a better immune system, and a lower risk for obesity. Now this healing food is being linked to bone health. Spanish researchers have found from recent studies that the intake of olive oil is related to the prevention of osteoporosis. Very few prospective studies, however, have evaluated the effects of olive oil intake on circulating osteocalcin. What is osteocalcin? It’s a protein found in the extracellular matrix of your bones. It’s involved in regulating mineralization in both your bones and teeth. For their study, the Spanish research team examined the effects of three different diets on circulating forms of osteocalcin and bone formation markers. The diets consisted of a low-fat control diet, a Mediterranean diet enriched with nuts, and a Mediterranean diet enriched with virgin olive oil. One hundred and twenty-seven elderly men at high cardiovascular risk were recruited for the study. The researchers looked for associations between baseline and follow-up (after two years) measurements of total osteocalcin, collagen, and something called “procollagen type I N-terminal propeptide” (PINP). PINP is a biochemical marker of bone formation. Baseline characteristics (age, body mass index, waist circumference, lipid profile, fasting insulin levels, and bone formation markers) were similar in all intervention groups. The researchers found that total osteocalcin concentration increased significantly in the Mediterranean diet enriched with olive oil, along with increased PINP levels. However, participants eating the Mediterranean diet enriched with nuts did not show these increases. Interestingly, the consumption of olives was associated positively with both baseline total osteocalcin and the two-year osteocalcin concentrations in the participants. 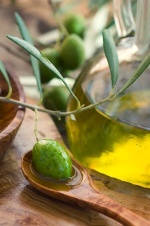 The researchers concluded that consumption of a Mediterranean diet enriched with virgin olive oil for two years is associated with increased serum osteocalcin and PINP concentrations, suggesting protective effects on bone. This leads great health advice for you regarding your diet and bone health. Follow their advice and eat a diet based on the healing foods included in the Mediterranean diet, with a particular emphasis on olive oil.